Work belts are required for various application areas. One can differentiate between fall-arrest harness, sit harness and holding belt. Fall-arrest harnesses are required for work at heights where a fall is possible. Work belts are used for restraint systems and workplace positioning and must not be used where there is a danger of falling. The sit harness is used for work on a hanging rope. An optimal belt or harness is distinguished by its wear comfort. 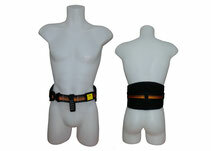 IMMOOS offers various belt and harness types for various work situations. 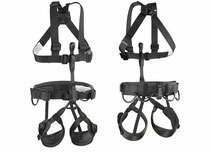 The whole assortment of harnesses from Petzl, Skylotec and Teufelberger are also available. The classic all-rounder for interventions of all kinds. The comfortable leg loops prevent the strap from cutting in. Simple fall-arrest harness for catching falls from heights. 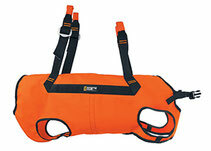 Special restraint belt for various rescue systems with holding loop to the front. Rescue triangle for all types of rescues of persons. Efficient and simple handling. Special rescue bag for babys/children up to 25 kg. Suitable for little children from 40 - 110 cm, the fixation is possible with 3 belts. The bag can be fully closed with zippers. Easy-to-put-on dog harness for abseil descending and helicopter transport.